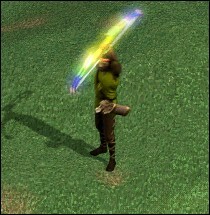 Archers start with Basic Combat and Basic Archery. Archer hero cost in Preserve is 1500 Gold. Archer hero cost in Tavern, Haven and Asylum is 2000 Gold. Archer hero cost in Stronghold is 2500 Gold. Archers cannot be hired in Necropolis and Academy. Biography: At this age, Elder Counselor Anium's duties should be limited to giving strategic advice. Since the Reckoning, however, this charismatic old elf has come out of retirement to help his people and fulfill his longing for one last glorious adventure. Biography: An elf with many shady dealings in his past, Blackdog is sometimes shunned by his own people. Nonetheless, he is loyal to his friends. He has traveled extensively over the years and made many interesting friends from all walks of life. Biography: Callis is a cold and emotionally distant man, a trait that serves him well when on the hunt. While his tendency to rudely point out the faults of others keeps him from gaining any close friends, Callis is still highly respected for his archery skills. Biography: Erensar trained with and fought beside the famed elven hero Gelu, but never received any notoriety even though he felt he was a better archer. Now that Erensar is out from Gelu's shadow, it is his turn to shine. Biography: Fahtrim fled Erathia in a hurry and spent several years wandering before he came to settle among the elves. During the Reckoning, he revealed his bold selflessness by staying behind until the last possible moment to help others through the portals, a surprisingly valiant act from someone accused of murder. Biography: A renegade who has been both an enemy and a hero to the elves, Gillion always considered his chances for profit before he took any action. Recently, he had a change of heart and takes his role as a defender of nature quite seriously. Biography: Ignatius once served the Kreegan demons for the opportunity to vent his legendary rage. After the Reckoning, he was nursed back to health by powerful elven healers. They also cured his fury, explaining that it was a result of a curse placed on his mother before his birth. Biography: Ivor proudly traces his lineage back to the Silence. Though born into elven nobility, he remains an archer - one of the best - who fights for the greater glory of his race (and himself, of course). Regrettably, the destruction of AvLee and the loss of his wealth hasn't quelled his arrogance. Biography: Kyrre volunteers for every scouting mission, often vanishing from camp for days at a time to watch the borders. He is drawn to the solitude of the wilderness where he can study the plants and animals and bask in the peaceful silence. Biography: When Merlith was just a boy, his village fell victim to a battle between the Forest Guard and an army of undead. Fortunately, one of the elven soldiers discovered him with his slain parents. That soldier adopted the human boy, teaching him to be an excellent archer. Biography: A veteran of countless military campaigns, Ryland was the first (and to date, the only) human ever accepted by the Elder Council to be a commander of the Forest Guard. Some of his men joke that Ryland was really an elf who died and was accidentally reincarnated as a human. Biography: Theritos may be a braggart, but he backs up his swagger with his fierce fighting skills. He will taunt an opponent endlessly, even during battle, raising their ire until they make a fatal mistake - and then take advantage of them. Too bad his arrogance often makes his allies want to kill him too. Biography: Avanine has always been a bit of a tomboy. As a child, she loved to play war with the elven boys, and adulthood hasn't changed her much. To this day, she still gets a child-like pleasure from climbing trees and outsmarting her enemy. Biography: Enathrae's parents hoped their daughter would marry some day and become a proper lady, but she had other plans. She was drawn to the elven forests by stories from her childhood and fell in love with her adventurous life in the wilderness. Biography: Gwedmyr spent most of her life as a slave in Nighon's deadly tunnels. She escaped her cruel masters during the Reckoning and has since sworn to fight anyone who enslaves another. Whenever she finds a cave, she feels compelled to search it for the enemy. Biography: Ilia tends to empathize with both sides of a dispute, for one is never completely wrong as far as she is concerned. This makes her a good arbitrator of disagreements, but since Ilia never wholeheartedly condemns her enemies, some fear she is also capable of switching sides at any moment. Biography: Jenova is well-loved and respected among the elves, the envy of most women and the object of desire of most men. But Jenova ignores her admirers to concentrate on a search for something that has been missing from her life. Unfortunately, she doesn't know what that something is. Biography: Kamiana, being the youngest of six children, grew up knowing how to shoot a bow and swing a sword. Like all her siblings before her, she patriotically volunteered to become an archer - not that she had any interest in doing anything else. Biography: Lindette is a 'mug-is-half-empty' kind of person, always anticipating the worst possible outcome. But her fellow archers put up with her depressing outlook on life, for when disaster does strike she is always ready. Biography: No matter how many wars Mephala fought, there was always a new one waiting around the corner. Her heart was no longer in it. And then came the Reckoning. Today, she still fights to protect her people, but she also searches for a way to rekindle the passion of her youth. Biography: Neska spent years as a crossbowman in the Erathian military disguised as a young man because peasant women were not permitted to enter the service. A near fatal injury brought her into the care of an elven healer who discovered her secret and offered her an opportunity to serve in the elven Forest Guard, where she could openly fight for the common good. Biography: Pyral took up archery for sport at first. She had such uncanny accuracy with the longbow that her people practically forced her to become an archer. The day she killed her first enemy, however, she ceased shooting for the pleasure of it. Biography: Shyn was a 'wild-girl' raised in the wilderness without human contact until an elven ranger discovered her. He taught her how to speak, how to use the bow, and how to live among others, but this awkward girl still feels most comfortable around the animals of the forest. Biography: Snowjay is the only child of a famous human knight and the elven princess he loved more than life itself. Numerous songs have been written about their tragic deaths, constantly reminding Snowjay of her loss. Now, she just longs to protect her people in their time of need while remaining as anonymous as possible. 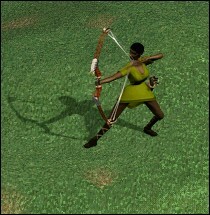 Biography: Keen-eyed and fearless, Trinni used to spy on the enemy before she was old enough to pick up her first bow. She would count troop numbers and types from a vast distance, relaying the information to her elders. Now that she's old enough to fight, she's ready to prove her combat skills as well.